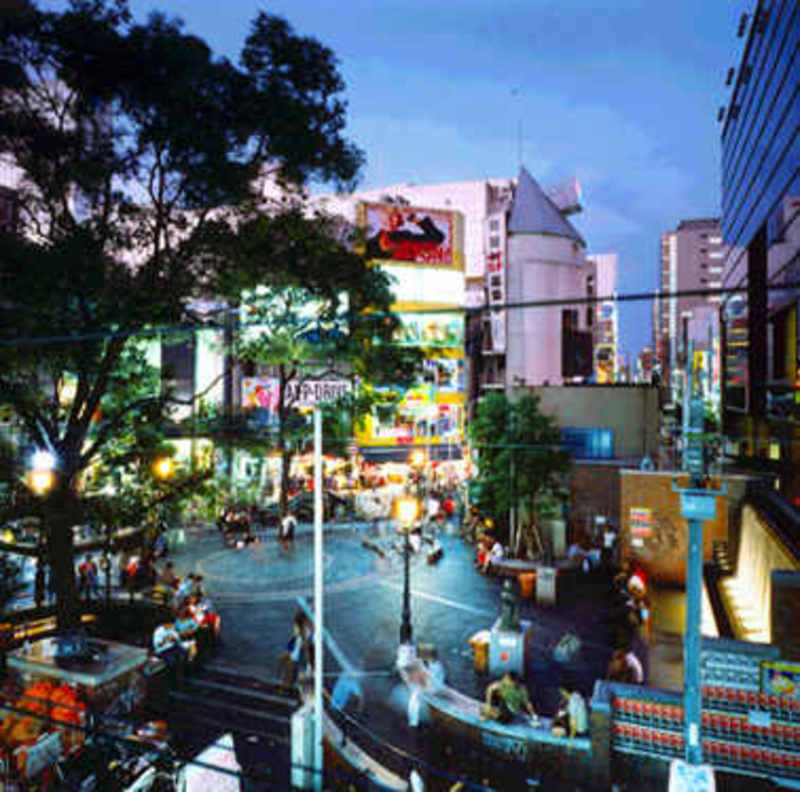 The area of Namba (sometimes also written Nanba) is absolutely the most central zone of Osaka and it is a very popular neighborhood for shopping and leisure. Namba is a neighborhood to be lived. Go there and wander, also randomly. The only "monument" in the area is the Hozenji Temple, a buddhist temple built in 1600 that can be visited for free. A detail of the temple is a statue of Buddha called Mizukake Fudo that visitors wet with some water, it is said that it brings good luck. The area around the temple, known as Hozenji Alley, is a very special and limited area that, with a stone floor and many izakaya, as well as with the temple Hozenji, has an atmosphere of "old Japan". The contrast between this area and the very close and chaotic Dotonbori, that has nothing to do with this old stretch of Namba, is especially strong. 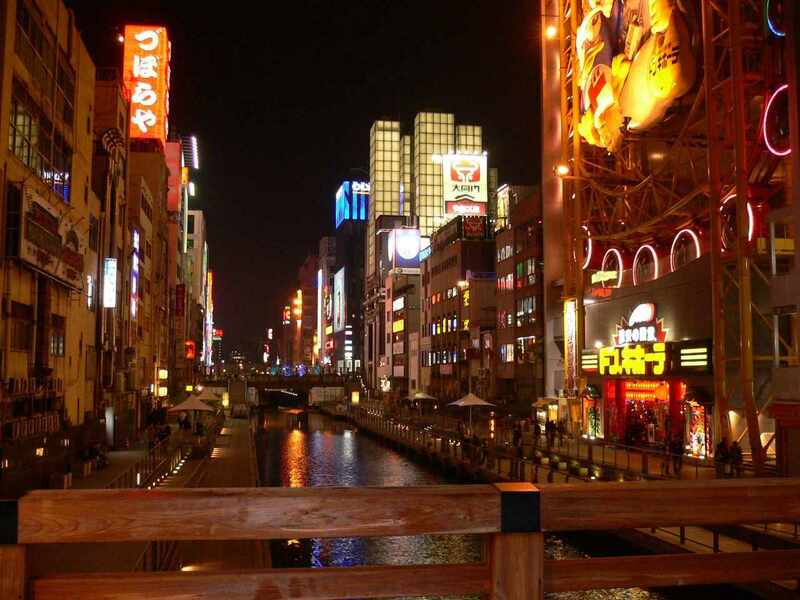 Dotonbori is the heart of Namba and is precisely the street south of the homonymous canal, although often with this name we refer to the entire area around the canal, also the northern. The area is always very crowded, during the day and especially at night when the neon glow combined with chaos of people make it amazing. 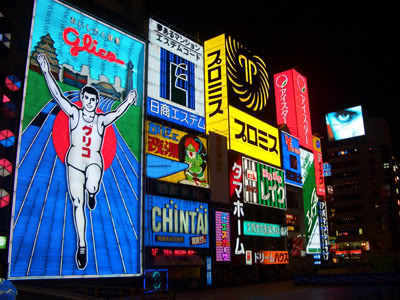 Icons, landmarks of this area are the Kani Doraku, a giant mechanical sign (it moves) with the shape of a crab of a restaurant specializing in crabs and the bright neon sign Glico Man, an advertisement for a brand of candy, but there are many other curious signs. 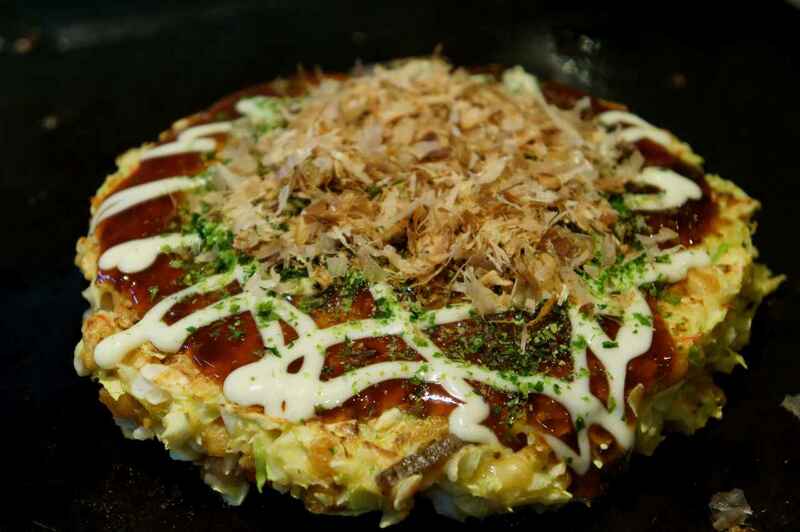 Dotonbori is an area full of restaurants and it is highly recommended in all the guidebooks to eat there some dishes from Osaka (see below the paragraph "Eating"). Shinsaibashi is located just north of the Dotonbori canal and it is the area around Mido-suji boulevard (Mido-suji dori), a large tree-lined avenue that connects the southern center of the city (Namba) with the northern center (Umeda). It is the absolute heart of Osaka's shopping, in this area in fact you can find some famous department stores (Parco, Loft, Tokyu Hands), many big stores of international brands but also hundreds of small shops. 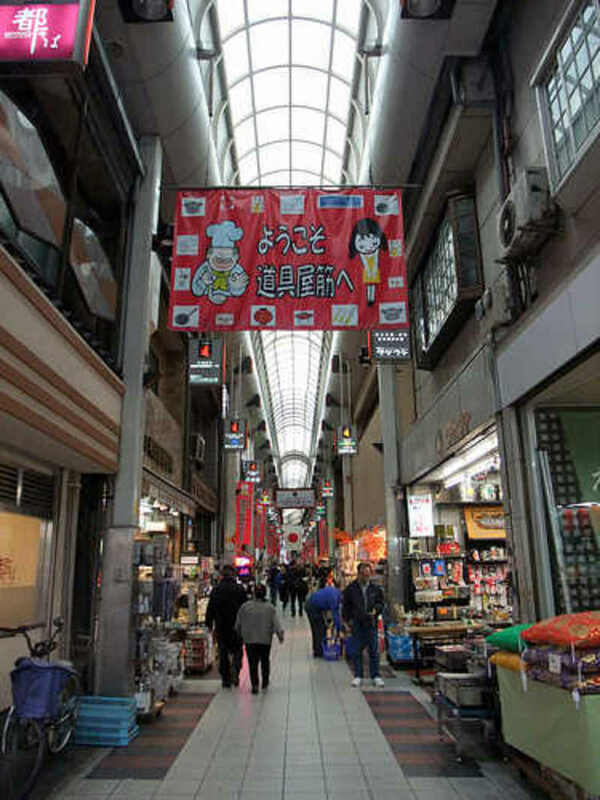 The old heart of ​​Shinsaibashi is located east of Mido-suji dori: a long covered shopping arcade parallel to Mido-suji dori, called Shinsaibashi-suji, that it is said it has a history of 350 years. West of Mido-suji dori there is instead the area of Amerikamura. An area just north of the Dotonbori canal, also called "Ame-mura", famous in the past as a shopping area ​​western products (especially americans), today it has partly lost this characteristic becoming the Harajuku of Osaka, where are concentrated a lot of young fashion shops (also used), music stores, cafes and clubs. On weekends the streets are filled with stalls and some street artist. The center of Amerikamura is Sankaku Koe, also called Triangle Park because of its triangular shape, that is a small square where you can sit on the benches and enjoy the spectacle of people dressed extravagantly. A "symbol" of the neighborhood is also a replica of the Statue of Liberty which is located on the roof of a building in the area and can be seen easily from there. Namba Parks is a particularly ambitious and building complex designed by the american architect Jon Jerde: The idea was to artificially create a natural environment that would break with the urban environment. The structure houses an amphitheater for shows and concerts, a shopping center from 2nd to 5th floor, while the 6th floor is dedicated to restaurants of both japanese and international cuisine. The peculiarity of the structure is in its roof that houses a real garden, which gradually descend following the height of the structure (see the photo below to understand better). The complex also includes the adjacent skyscraper (149 m), the Parks Tower, which has been also renamed PS3 Tower for its similarity to the Sony playstation 3 console. Also Osaka has its own little "Akihabara", located south-east of Namba station, a paradise dedicated to lovers of anime, manga and videogames, but also electronics and computer. I wrote a guide dedicated exclusively to this area. Two other distinctive places of Namba, but much less famous, are two covered shopping streets, Doguya-suji and Kuromon Ichiba Market. The Doguya-suji is a covered shopping arcade dedicated to food and articles for restaurants, something similar to Kappabashi-dori in Tokyo Asakusa district, but actually there are many other kinds of shops. It is located just east of Namba Station (see the map below). You recognize it immediately because at the beginning of the gallery there is the sign "Doguya-suji". The Kuromon Ichiba Market is another covered shopping street about 600 meters long, along which there are many shops of any fresh food, meat, fish, vegetables. It is located north-east of Namba station, a little less far than a chilometer on foot, just south of Kintetsu Nipponbashi metro station. Also this road is easily recognizable because at the beginning you can see the sign "Kuromon". Near Nipponbashi station there is also the National Bunraku Theater, where Bunraku spectacles are performed (a japanese theatrical art of performances with large manipulated marionettes). The price of a ticket varies from 2000 to 5000 yen and headsets are often available also in english to follow the performance. More information at this link. 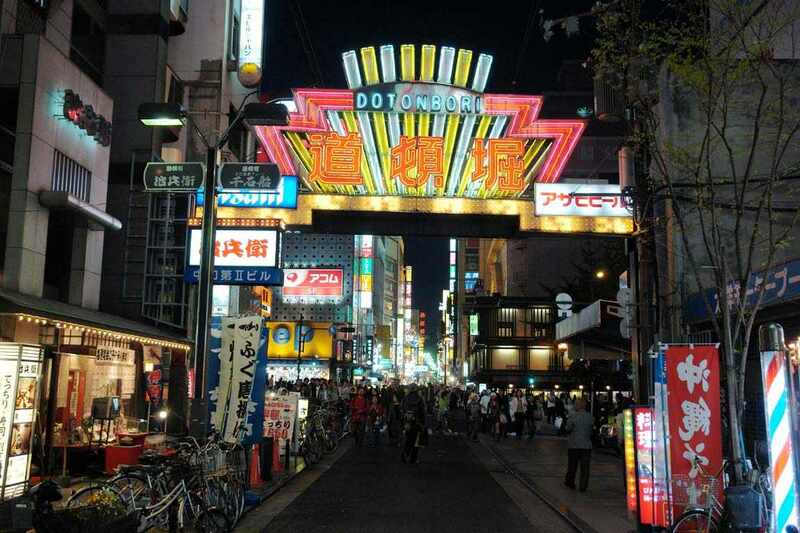 The Namba area is of course perfect as a location to stay having regard to its centrality and nightlife. If you are traveling alone and your budget isn't very big, I recommend the Cabin hotel Midousuji-Namba, a new hotel concept, a mix between a hotel and a capsule hotel, it is located in a central location a short walk from Namba Station and you can sleep with 40 euros per night. To understand better what it is you can visit their website. There are also some internet cafes in the area. 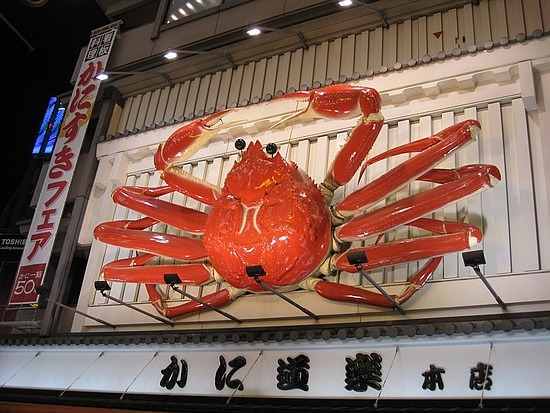 Osaka is famous throughout Japan for its great culinary tradition. The area of Dotonbori is one of the most popular areas of Osaka to eat. Very famous are the fried octopus balls, called takoyaki, sold everywhere and very good everywhere, but if you really want the best of the best look for the booth of Otakoya. 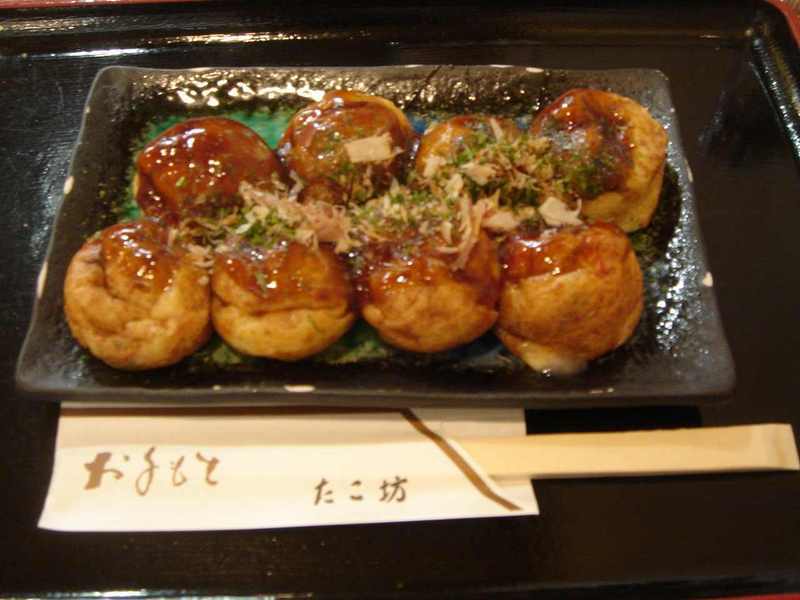 I also recommend Creo-ru, another restaurant specializing in takoyaki, but also in okonomiyaki (Another typical dish of Osaka). As regards the ramen, one of the most popular places in Dotonbori is Kinryu Ramen, which has 3 stores in the area open 24 hours. You recognize it immediately because of the particular sign representing a giant dragon. The Kani Doraku restaurant, that of the famous crab mechanical sign , is a very good restaurant specializing in crab but be careful because it's very expensive.